Violinist/violist Allison Lint currently resides in north Overland Park, where she maintains a private studio of advanced middle- and high-school students. Allison is a member of the St. Joseph (MO) Symphony Orchestra, and also performs regularly with the Wichita, Topeka, and Southeast Kansas symphonies. She is currently on adjunct faculty at Fort Hays State University teaching an undergraduate course in music history. 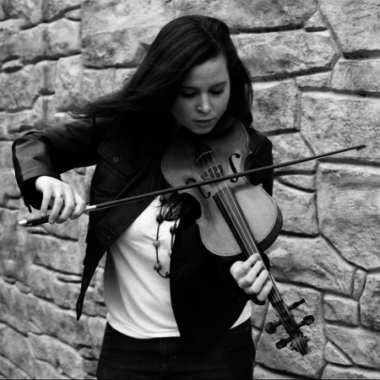 In the past twelve years of freelancing, Allison has appeared as a violinist, violist, and pianist in chamber music recitals, weddings and corporate events, and live pop/rock/folk shows. A native of Ohio, Allison completed her music studies at the Oberlin Conservatory, studying violin with Gregory Fulkerson and viola with Peter Slowik and also attaining a minor in Music History. She then took a five-year hiatus from higher education and entered the world of professional theater, eventually being heard as a regular pit musician for almost every stage venue in Northeast Ohio. To date, her favorite role is that of the “Fiddler on the Roof,” which she has played four times. In 2014, she earned her Master of Music at the University of Akron through a Graduate Teaching Assistantship in Strings. Before completing her graduate degree, Allison won a position in the second violin section of the Akron Symphony Orchestra, where she performed regularly for three seasons. In 2015, she joined the Cleveland Pops Orchestra for a “Pokemon: Symphonic Evolutions” tour to Cincinnati, Ohio and Buffalo, New York. Allison also made regular live and recording appearances with Los Angeles-based pop/rock group The Strange Familiar, seen in the top 48 of NBC’s “America’s Got Talent” season 5. She has been invited to participate in masterclasses with Gil Shaham, Anner Bylsma, Vadim Gluzman, Andres Cardenes, and Midori. After Allison received an unusual medical diagnosis as a teen, she embarked on a mission to bring rare disease awareness to all 50 states through her nonprofit organization, Violin for Vasculitis, Inc. V4V has since been featured on CNN’s “Human Factor” and is set to reach its halfway point in Fall 2018. To this date, V4V has seen 36 events in 23 states, and Allison has been invited to speak at universities, churches, libraries, town halls, historic landmarks, and medical symposia across the nation. Follow her travels on Facebook and Twitter, or read more at www.ViolinForVasculitis.org. Allison’s violin is an 1826 Scottish fiddle, a generous gift from her late grandfather. When not performing, she spends her time reading economics and history, competing in karaoke contests, and exploring the local barbecue offerings and jazz traditions that make her proud to call Kansas City home.